some. With this information I will now proceed with my recap. out of the woods and kills two scouts and as she escapes, Mearle shoots her in the leg. plan on making a run for supplies and Daryl sweeps the lower levels. points out that maybe the Governor and Woodbury is growing on her. the phone calls and asks him to keep them a secret. 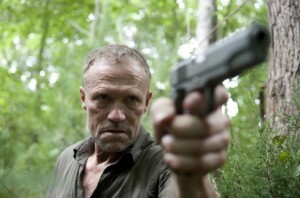 fights him, Merle shoots him in the head. Rick talks to a woman who says his name and asks about Lori and wants him to talk about it. When he asks how she knows his name, the line goes dead. kidnaps both of them by gunpoint and takes them and their vehicle to Woodbury. dehydrated and dazed. Daryl picks her up and carries her out. prison yard and in the distance he sees a group of walkers and walking with them is Michonne. She is carrying the baby supplies. because it is obviously laying the groundwork for an upcoming battle and a terrific cliffhanger. Hopefully, there won’t be huge body count and most of the characters will make it to Season 4. Stay tuned folks…it’s getting good! 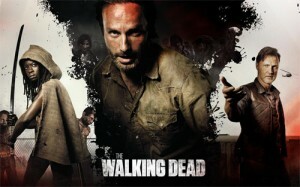 ‘Walking Dead’ Season 3 Recap – Episode 15 ‘This Sorrowful Life’!! This entry was posted on Thursday, November 22nd, 2012 at 11:56 am	and is filed under News, Television. You can follow any responses to this entry through the RSS 2.0 feed. You can skip to the end and leave a response. Pinging is currently not allowed. « Geek Deal of the Day! ‘The Godfather’ Blu-ray Movie Set!!! Only $16.99!! !